Bonny Doon Vineyard is situated in the Santa Cruz Mountains in the tiny hamlet of Bonny Doon. Randall Grahm follows in the footsteps of another great winemaker from the Santa Cruz area in so far as he was a Philosophy major until bitten by the wine bug. 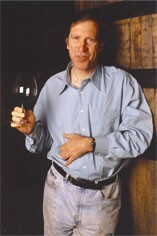 A complete and insufferable wine fanatic, he returned to the University of California at Davis to complete a degree in viticulture in 1979. The original vineyard (the Marsanne and Roussanne of Le Sophiste) died of Pierce's Disease 3 years ago and Grahm's fruit sources now include: Washington State (its high latitude and long autumn days make it perfect for riesling); San Bernabe in Monterey (the largest vineyard in the world); San Francisco's Sacramento Delta (the sandy home to 19th century Rhône vines); the Chequera Vineyard in Paso Robles for the Roussanne. Grahm is known as the "Rhone Ranger" for his pioneering work in the popularization of Rhone and Provencal varieties in California. Fermentation vessels are stainless steel (for reds including syrah and mourvedre, rosé and spicy whites such as malvasia) or very large old oak vessels (roussanne, zinfandel etc). The Moscato is pressed from frozen grapes and has been fortified discreetly. Rhône reds tend to be punched down, whites and delicate reds e.g. pinot noir pumped over. Reds are matured in oak puncheons of varying ages.